In the year 400 AD, the city of Rome was inhabited by around 1 million people. Britain was a thoroughly Roman province with public baths and flourishing cities. By the year 600 AD Rome was home to 50,000 humans, and Britain was on its way to becoming England — dominated by pagan German tribes. The short answer is that the Roman Empire fell. The longer story — some scholars argue that Rome did not quite fall, rather, it transformed into something different. To some extent, this is a matter of definitions. What we do know (rather definitively) is that the material conditions of the Western Roman Empire changed greatly over the centuries that we define as the decline and fall of the Empire. 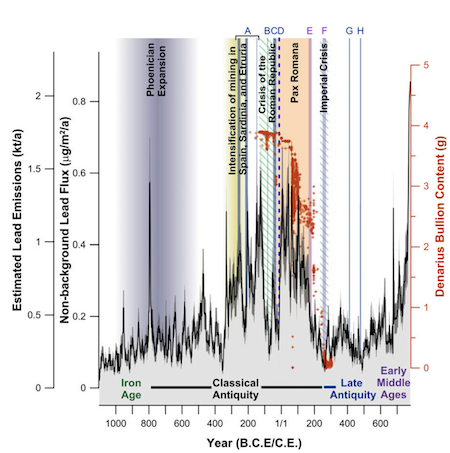 Recent work using lead pollution as a proxy for economic production overlaps very neatly to periods of decline and collapse… and subsequently recovery. There is no doubt today that there were major changes in the later centuries of the Roman Empire, and its transition into the post-Roman world of barbarian kings. These changes were material, as the Roman system of economic production and exchange collapsed, and these changes were cultural, as the Christian religion and Latin language disappeared from provinces such as Britain and the interior of the Balkans. But were the migrations of the barbarians the movement of distinct peoples, bound by kinship? Or, were they migrations of opportunists, who created identities on-the-fly to take advantage of the vacuum of authority in the collapsing Roman landscape? The case of Britain, and how it became England, is illustrative of the debate. In the late 19th and early 20th centuries, the assumption was the the arrival of the Angles, Saxons and Jutes resulted in a mass slaughter of the native Romano-British. 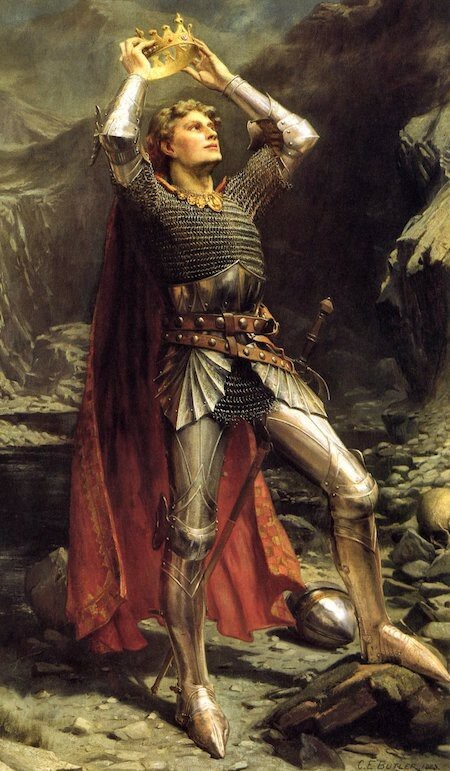 The conflict was remembered in Welsh folk-memory, and eventually transformed into the pseudo-historical legend of Arthur. Despite King Arthur’s iconic status as the once and future king of the British Isles, it is important to remember that his enemies were the ancestors of the English! Or were they? As the 20th century proceeded, a school of thought emerged that said that in fact the Anglo-Saxon hordes were a small group of mercenaries. The vast bulk of the ancestors of the English would have been Romano-British people who took up the culture of the new elites. This is where genetics comes in. 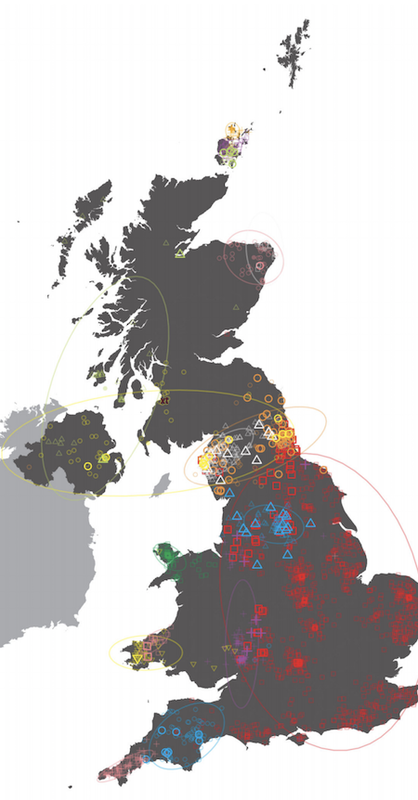 Over the past 20 years, a scientific project ambitiously titled “The Peopling of the British Isles” has collected data on thousands of individuals whose genealogies are verified to particular locales within the United Kingdom. 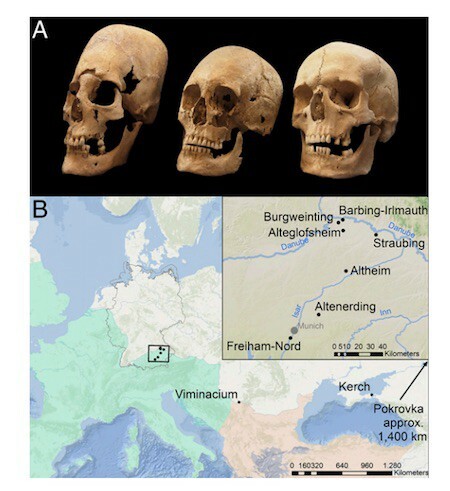 Comparing the genetic profiles of British individuals, as well as comparing the British with peoples on the European continent, the group arrived at some conclusions which shed light on the “Anglo-Saxon” question. The majority of the ancestry in England does descend from Romano-British people. They were not exterminated, but rather a substantial minority, which varies by location and also descends from German migrants from the continent. This was not a small group of mercenaries which took over a preexistent order, but the migration of a people, who eventually assimilated the British majority into their folkways. Of course not all cases were so extreme. Anglo-Saxon England in many ways was totally unrecognizable as Roman Britain, so sharp was the cultural rupture. In much of the post-Roman world, the conquest elite was much smaller, and eventually demographically absorbed by the local “Romans” (as they were still known). Yet even in these cases, the distinctiveness of the invaders comes across both in the written records, and now, in the genetics. The Lombards were a German people who invaded and conquered much of the Italian peninsula in the second half of the 6th century A.D. Barely Christianized, and unfamiliar with the ways of the Romans, they are described as a very alien and barbaric people by historians of the period. They were often depicted as blonde. Though eventually absorbed into the post-Roman elite, they gave their name to the northern region of Italy, Lombardy. New work in ancient DNA clarifies just how distinct and separate the early Lombards were from their Roman subjects. 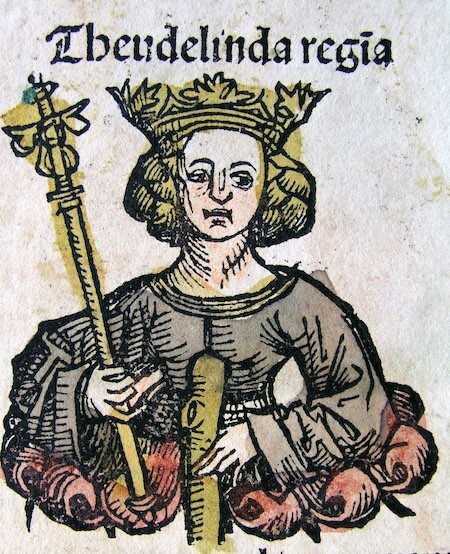 The Lombards migrated to the Italian peninsula via what, today, is Hungary. A group of researchers excavated DNA from Lombard cemeteries in both Hungary and northern Italy, dating to the middle 6th century to the early 8th century respectively. What they found is that there were two distinct clusters of people in the cemetery. One group, buried with rich grave goods, and some of whom seem to have very high protein diet, were genetically exactly like Northern Europeans. Another group were more like Southern Europeans. The two groups were generally segregated within the cemetery. The men buried with rich grave goods and of Northern European genetic heritage tended to be related along the paternal lineage. What are the conclusions one can draw from this? The Lombard migration was clearly a movement of a coherent ethno-religious group. The historical record is clear that these people were very culturally distinctive from the Romans whom they conquered. Additionally, these results indicate that the Lombards were accompanied by a group of lower status individuals (judging by the lack of grave goods and less rich diet) who were more genetically similar to the native peoples of Southern Europe. Finally, the leadership class of the Lombards were a paternal kinship group. Finally — the Huns — where we started. To a great extent the Huns are sui generis. Many of the barbarian peoples recorded in the historical records conquered parts of the Roman Empire and settled down. Eventually, they wrote down their own histories, and even put down their language in written form. Not so for the Huns. They exploded on the scene in the late 4th century, as recorded by Ammianus Marcellinus. The Christians saw in their arrival the harbinger of the End of Days. A purely nomadic people, the Huns were like nothing the Romans had seen before. 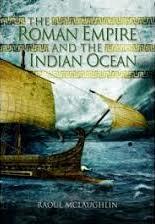 The arrival of the Huns set in motion the great migrations which coincided with the collapse of the West Roman Empire. But… where did they come from? Who were they? The bestial manner in which the Huns are described by Classical authors has suggested to some historians that the descriptions were tropes. The power and vitality of the Huns had to be accompanied by descriptions which were as startling and novel. They had to be a force of nature to sweep all the peoples before them as they had. But the Huns faded as quickly as they arrived. 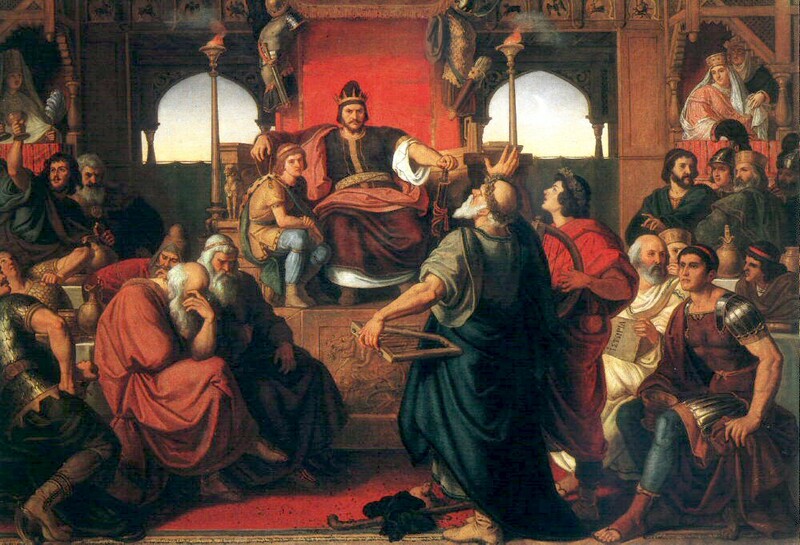 After the defeat of Attila in the middle of the 5th century, they slowly disappear from history. But they persist in archaeology. The Huns seem to have dispersed into the Balkan interior, and slowly become absorbed into the local population. Though they were never a literate people, they did have particular custom of skull deformation which leaves archaeological records. This practice persists in some locales deep into the 6th century. Recently, a paper was published that revealed a distinctive genetic profile, likely of females of Hunnic background. In Bavaria around 500 A.D. a group of high status males seem to have married women who were migrants from the Balkans, as adduced from isotope analysis. Some of these women exhibited distinctive skull deformations associated with Huns and other Central Asian peoples. One of these women was ~20% East Asian. One hypothesis has been the Huns descend from a Turkic group present in Mongolia named the Xiongnu. The Huns were the westernmost extension of the Xiongnu horde. These results are the first definitive evidence that the Huns were in fact of East Asian provenance. When Ammianus Marcellinus commented on the beardlessness of the Huns, he may simply have been observing a characteristic more typical of East Asian peoples. These examples show that the relationship between history, genetics, and archaeology is complex. Until recently the genetic component was not available to us. Now that researchers have access to the genetics of ancient peoples they can confirm or reject the hypothesis that these groups were distinct ethnolinguistic entities. Genetics also allows researchers to explore in depth the diversity and range of migration which characterized the collapsing post-Roman world, transforming vague guesswork into probabilities. Interested in learning where your ancestors came from? 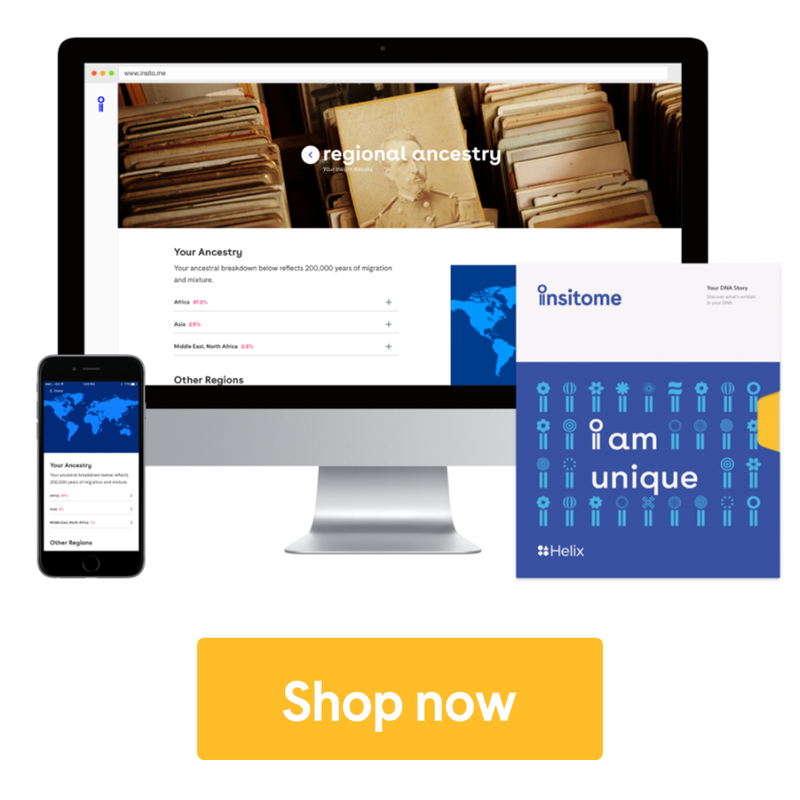 Check out Regional Ancestry by Insitome to discover various regional migration stories and more! The fall of Rome and the wandering of peoples was originally published in Insitome on Medium, where people are continuing the conversation by highlighting and responding to this story. I periodically check up on Amazon’s monthly deals. Though the science section is usually pretty thin, the history deals are more numerous. A lot of them are not too good, or are reprints of very old books. But now and then you get a scholarly and dense work which is magically priced at below $2.00. So I bought a copy of The Roman Empire and the Indian Ocean: Rome’s Dealings with the Ancient Kingdoms of India, Africa and Arabia, and skimming over it it’s definitely not the most scintillating prose, but there’s a lot of interesting material in the book. If you are looking for a good book, I would recommend it, especially at that price.